When you are first considering your move to Shanghai, one of the concerns is the language. We asked Helen Walsh-Patient, a BISS Puxi parent who has lived in Shanghai since 2009 to tell us of her experiences of learning Mandarin. 'No walk in the park...' but it is fun. When I moved from the UK to Shanghai six years ago, my Chinese neighbour smiled when I told her I was about to start Mandarin lessons. 'Why would you bother when everyone here speaks English?' she asked. 'Besides, learning Chinese is no walk in the park, you know'. Unperturbed, I had my first Mandarin lesson the following week, just two weeks after arriving in China. We were a group of eight from all over the world. There was no pressure to master everything, no ridicule when we got things wrong, just lots of encouragement to join in. Our teacher explained some basic greetings, pronouns and verbs, and within a few lessons we were all chattering away. We worked our way through vocabulary and grammar for numbers, days of the week, food, clothing, shopping, places, buying tickets, dealing with house maintenance, directing drivers and that favourite of British pastimes, talking about the weather. I gradually developed confidence in using my Chinese in shops, restaurants and taxis. Occasionally someone would reply in English, but usually they would be delighted that I was attempting to speak in Mandarin. A turning point for me was being able to make phone calls and actually being understood. People will always tell you how difficult Chinese is, but in fact, some parts are wonderfully easy. For example, discovering there are no verb conjugations in Chinese comes as a welcome surprise to anyone who has previously studied French, Spanish, Italian or Latin. Similarly there are considerably fewer verb tenses than in French and Spanish. And people who have spent hours puzzling over all those German words for the word 'the' are very happy to see that Chinese does not seem to even use the word. In Mandarin plurals are rare - no need to add an 's' or other ending. As there are no letters, there aren't any capital letters either - useful for anyone who has struggled to remember to capitalize every noun in German. Chinese also has the same spoken word for 'he' and 'she'. Syntax is straightforward with many sentences using in the same word order as English - 'I learn Chinese' = Wǒ xué zhōng wén' - you can translate a considerable number of sentences directly. Mastering some basic phrases will enable you to communicate with your ayi, find things you want in shops and bargain for better prices in markets as you will look like a resident, not a tourist. After a couple of years studying Mandarin using Pinyin (reading and writing words using letters of the alphabet), I began to learn to read and write Chinese characters. For those coming from an alphabetic culture, learning characters is quite challenging as you need to train your mind to see words in a different way. When I look at a word, my mind automatically wants to decipher it phonetically. But Chinese characters are based on meaning, not phonics. Some have a sound clue as well, but for many characters, you have to simply learn them by heart. It's an intellectual challenge and great for sharpening your memory skills. I have now taken three HSK exams just for personal interest. These are tests designed for foreigners learning Chinese and can be sat at BISS and at many other locations at various times of the year. I still have group lessons twice a week. I am a long way from fluent, but now when I encounter spoken and written Chinese I am happy to feel included. For anyone considering learning Mandarin, I would say, 'Go for it!'. You are never too old to start. 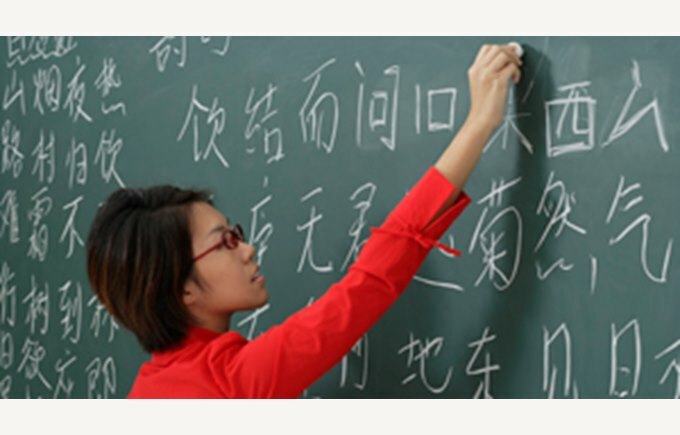 There are language schools and private tutors throughout Shanghai. You can also check out the courses for beginners, intermediates and advanced students at the local community centre and at universities. My neighbour has since moved house, but if she were still here, I would tell her that learning Mandarin has indeed not been a walk in the park, but nevertheless makes my life in Shanghai more fun.